What a fabulous book — and it’s only the first of several volumes! The introduction articulately establishes the book in context with its intent and historical significance. Many of the original scores, including those of the classic Universal monster films, are long gone, but with the help of this book, anyone can relive the creation of some of the most memorable film scores of all time. The book is well-produced and attractive. Bill Nelson’s cover illustration is quite appropriate for the theme of the first volume. I applaud Mr. Larson’s attention to detail and his writing is very readable. Any Monster Kid or other soundtrack enthusiast remotely interested in the rich and lasting legacy of horror, fantasy, and science-fiction soundtracks will not be disappointed in this book . . . unless, that is, you’re tone deaf. When it comes to film music historians, Randall D. Larson is the undisputed knowledge king of soundtracks. His incredible Musique Fantastique series is a godsend for those of us who love motion picture scores. Originally published in 1985 and long sought after by collectors, Mr. Larson presents a new 2nd edition, which is wholly rewritten and expanded. Musique Fantastique: 100 Years of Fantasy, Science Fiction & Horror Film Music (Creature Features) contains four books in total, with the first volume examining the Golden Age of film music (1900-1959). Randall Larson’s indispensable 1985 examination of sci-fi/fantasy/horror music has been published in a brand-new edition from Creature Features. Book one, now available in a limited-edition, trade-paperback run of 500 copies (as well as in ebook form), takes readers through the origins of genre music in silent films, ‘30s and ‘40s fantasies, to Franz Waxman’s benchmark score in “The Bride of Frankenstein” and Max Steiner’s “King Kong.” Scores for Japanese classics like “Godzilla,” the work of composers Bernard Herrmann and Jerry Goldsmith in “The Twilight Zone,” soundtracks composed for some of the ‘50s monster mashes, and full chapters on Dimitri Tiomkin, Roy Webb and Miklos Rozsa are all examined here with Larson’s expert commentary provided throughout. One thousand and seven hundred pages: that’s what will be printed for this updated edition of Musique Fantastique once its four volumes will be completed. In other terms, it is the most exhaustive and captivating study devoted to “Mad” Movies ever, from the silent era to nowadays. King Kong, The Bride of Frankenstein, the Universal Horror Classics, the Golden Age, Miklos Rozsa’s fantasy scores, Roy Webb, SF B-movies of the 50’s, television scoring (Irwin Allen, Star Trek, Twilight Zone, Battlestar Galactica, Amazing Stories…), the use of classical music in Kubrick’s films… This 1st volume gives enough information and analysis to wait for the next ones, which will feature Bernard Herrmann, Italian B-movies, Jerry Goldsmith, John Williams and the glorious eighties, among many other subjects. Few writers have attempted to define or explore the marvelous mystique of scoring for fantastic films. At the forefront of this modest community has been Randall Larson, a passionate champion of film composers and their artistry for some forty years. Film and theater critics have endured a long, unhealthy tradition of unfairly and, often, maliciously criticizing films outside the respectable main stream of motion picture production. Composers writing music for this so-called, sub-genre have rarely been accorded honor or reward by either their critics or peers. Entertainment Tonight’s Leonard Maltin, to his enduring credit, has represented the “everyman” in his many years of motion picture journalism. If there is a comparable writer specializing in the often maligned field of music for motion pictures, it would almost have to be Randall Larson, a humble “everyman” whose often remarkable journalism and prose regarding music for the movies has distinguished itself over these many years as eloquent, poetic, and profound. 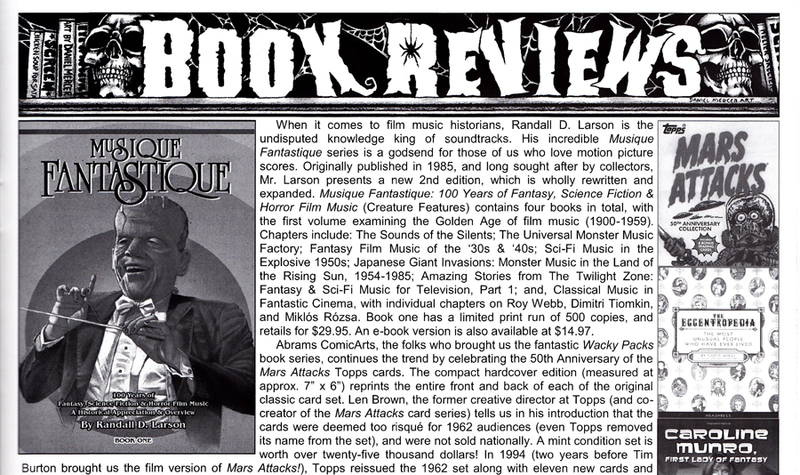 For the last several decades, Randall D. Larson has been one of the preeminent soundtrack journalists for such magazines as Soundtrack and Cinefantastique, let alone one of the most readable writers in the craft. Larson’s strength has been explaining his appreciation of all genres of movie music in a way that’s approachable for fans without sounding like an academic dissertations for the cultural elite. Larson’s found not only time to review and cover just about every album and their composer, but to also write a few books on the side, the most essential of which now gets turned from one volume into a four-book series that’s likely to stand as the “Lord of the Rings” of score appreciation. 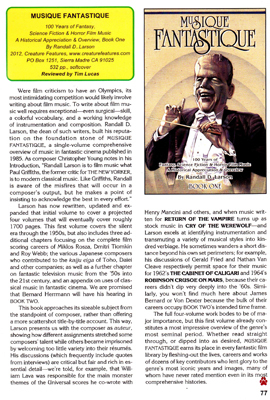 First up is “Musique Fantastique.” First published in 1985, “Fantastique” has been re-worked to become the 500-page alpha in the omega of Larson’s thoroughly entertaining and informative 1700 page epic, the material come alive again in Creature Features’ presentation (complete with charming monster-conducting art by Bill Nelson). Covering silent movies like “Metropolis” and “The Hunchback of Notre Dame” to the songs of “The Muppets Take Manhattan” and “Day of the Dead’s” synth calypso, the author also hits such TV chestnuts as “Captain Scarlett” and “Star Trek,” with all points in between. Larson lucidly covers the scores as he breaks down their creators’ careers, giving a global ear as to how horror, sci-fi and fantasy stylings have evolved from orchestral to electronic expression, all with an enthusiasm and knowledge that’s remained unabated for the author.